The three Chambers brothers, James, John and Benjamin and their sister Priscilla arrived in South Australia in 1837. James came out first. He sailed on the Coromandel which left England in September 1836. It was his responsibility to find some sort of accommodation for his wife Catherine, brother John with his wife Mary and brother Ben and sister Priscilla. They would sail six weeks later on the John Renwick which arrived only three weeks after the Coromandel. On board the Coromandel were also some other migrants who were to play an important part in the colony's early days. They were Edward Stephens and his wife Emma and Doctor Thomas Young Cotter. When James arrived, all migrants, including Governor Hindmarsh, were still living in tents on the sand dunes at Glenelg. It was James who built the first cart to transport goods from the beach to the tents and he also carved out a road from Glenelg to Adelaide and from there to Port Adelaide. After the arrival of the John Renwick it was the brothers first job to build suitable housing for their families, first at Glenelg and later in Adelaide. Within a year they also had established themselves as farmers and graziers. John being the first to use a plough in the colony. By the early 1840s James and Catherine were living at Montefiore Hill, North Adelaide and John and Mary at Cherry Gardens. However late in 1858 they decided to build a house at Richmond to be closer to their friends and business. John advertised for a builder and contractors who could view the plans at Mr Kingston's Office in Grote Street. Very little is known about Benjamin, who also held land in the Cherry Gardens-Coromandel Valley area. He was engaged in farming and dairying until his death in May 1852. Priscilla had married Alfred Barker and lived at Yankalilla. James had tendered successfully for the Northern Mail to Burra by 1845 and within five years had himself established as the official Contractor for Inland Mails, employing dozens of men using some 350 horses. The Postmaster General, John Watts was more than pleased with James and said, 'the services of conveying the mails during 1850 has been well and satisfactorily performed by Mr Chambers. James also found time to be a member of the Adelaide Jockey Club and Clerk of the Course during its 1850 racing season. During 1851 James earned $2,800 carrying the mail to the north. While on the Burra run James often called in at his sister's place who had recently moved from Yankalilla when her husband had bought the Burra Hotel. When James retired from the mail run in 1853 he sold the business for $28,000 and went back to England for a well earned holiday. By the mid 1840s the Adelaide area had become too small and restricted for the Chamber brothers. They were too ambitious and looked beyond the settled districts to the north to select sheep and cattle country. John took up the Pekina run and stocked it with cattle from New South Wales. Other runs acquired at that time were the Cobdogla run on the Murray River and the Mount Remarkable run which was later sold to John Howard Angas. Within twenty years the brothers held more than 1,700 square miles of country which included such well known properties as Moolooloo in 1853 and managed by John Rose, Bobmoonie, Oratunga which was managed by George Warland, Wirrealpa, Stuart Creek and Caurnamont. In 1863, just before the start of the great drought, they sold Moolooloo, Wirrealpa and Bobmoonie to Philip Levi for $96.000. The Chamber brothers never lived on any of these properties but employed first class managers to look after their interests. Most of these runs and their later mineral leases were surveyed by their friend John McDouall Stuart. Apart from cattle and sheep the brothers were also very much interested in mining. On 23 July 1857 James and his friend William Finke were issued with lease no 5 over eighty acres at an annual rent of $80 over what became known as the Oratunga Mine. In fact they were the first to work a mine in the Northern Flinders Ranges. They also operated the Mount McKinley and Mount Deception mines in 1859. Later, after the formation of the Great Northern Copper Mining Company, of which both James Chambers and William Finke were colonial managers, they sold their Nuccaleena mine, and another ten mines, to that company. On 19 January 1860 the ship New Margaret left Gravesend in England with 10,000 ore bags, 160 barrels of gunpowder and a large quantity of mining implements for the Chambers' mines. James even had one of the streets in Nuccaleena named after him. John Chambers too took out several mineral leases in the north, including seven around Blinman. Another interest of them was that of exploration. They financed several expeditions, in particular those of their friend Stuart. John McDouall Stuart started his most famous expedition, when he successfully crossed Australia, from James Chambers' home in North Adelaide. His daughters had made a large flag for Stuart whereas James paid the wages for both Stuart and his second in command Kekwick. From Adelaide they rode first to Moolooloo where the expedition was farewelled by John Chambers. Unfortunately James died on 4 August 1862 before Stuart's return to Adelaide. During his many years of exploring Stuart had named many geographic features after the Chambers brothers and their families. Chambers Creek on section 789, Hundred of Noarlunga and Mount Chambers and Chambers Gorge near Lake Frome were named after James and John. Chambers Pillar in the centre of Australia was named in honour of James. The River Chambers was named by Stuart after 'my late lamented friend James Chambers, whose zeal in the cause of Australian exploration is already well known'. Naturally there was also a Priscilla Creek. The Fanny and Fanny Springs were named after John Chambers' eldest daughter. Fanny Chambers would later marry Alfred Francis Weaver, son of Afred Weaver of Woodlands. They were married on 29 June 1876 by the Rev Richardson Reid at Trinity Church. Mount Charles and Charles Creek were named after John's eldest son. Chambers Bay was named to thank the girls for making the flag. James' daughters, Catherine and Anna, were honoured with The Katherine and Anna's Reservoir. The Mary was named after John's wife. Many members of the Chambers family and their descendants are buried at the North Road Cemetery. The headstone marks the site where Charles Chamber, eldest son of John and Mary is buried. 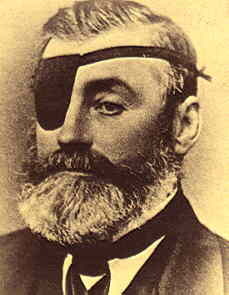 He was born on 18 November 1843 and died on 24 June 1877. 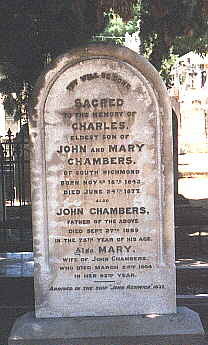 John Chambers died 27 September 1889, aged 75, and his wife Mary on 24 March 1904, aged 92.